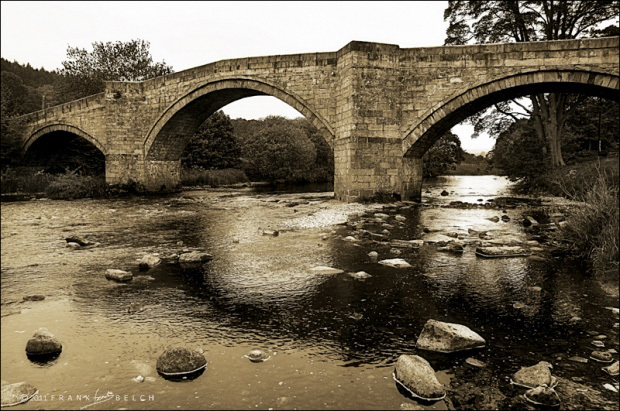 Barden Bridge spans the River Wharfe a little way upstream from Bolton Abbey. It carries a narrow road that certainly keeps you on your toes as it snakes its way down this part of Wharfedale. There is parking next to the bridge but you need to be lucky to find a space when the weather is good. Earlier in the day I had been in Upper Wharfedale and the river up there was all but dry, but down here on its lower reaches the water, while shallow, filled the river bed. Bolton Abbey is always worth a visit and there are paths along the river that provide relatively easy walking, much of which is push chair and wheel chair friendly. There are three parts to a visit to the abbey. Bolton Abbey itself, then further upstream is the Cavendish Pavillion, further still upstream is The Strid. Currently the Cavendish Pavillion is closed for refurbishment until March 31st. The entrance fee to the Abbey car park gives you access to the other two sites too. A short, fairly flat walk from the Cavendish Pavillion and you can usually find the “Bodger” working with traditional tools and equipment to make various wooden artifacts. A short drive from the Pavillion up the valley brings you to the Strid Car Park. It is a steep walk from there down into the river valley to the Strid, which is a very narrow part of the river where the Wharfe forces its way through the rocks and can be quite impressive. If you want to avoid the steep walk you could instead continue your walk from the Pavillion along the path to the Strid instead of driving. Beautiful photo, sounds like a grand place to visit! Thanks BoJo, yes it really is a beautiful part of Yorkshire and a wonderful place to visit.